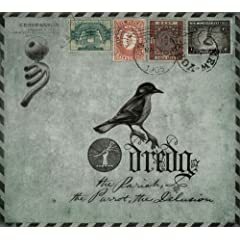 This was my third time seeing dredg, and the second time this year. Their latest record (The Pariah, The Parrot, The Delusion) is an amazing album… a definite front runner for album of the year for me. It is inspired by Salman Rushdie’s essay “Imagine There’s No Heaven: A Letter to the Sixth Billionth Citizen.” I gladly made the trek up to Portland, and now that I’d been able to soak in their latest album (it wasn’t out when I saw them in April), I knew much more of the material being played. I was also able to bring my camera… yay! The first opener As Tall As Lions were really good. The first song, the bassist was acting a bit goofy. I thought it seemed weird, or that he was “overacting.” However, throughout their whole 5-6 song set (35 minutes), he kept it up. Maybe it grew on me, or maybe I changed my mind and felt he really was into it that much (plus he’s got some backing vocal chops). :) Anyway, As Tall As Lions were a 6-piece in this live setting. They’re from New York, and had a good indie rock vibe – nice vocals, nice groove, and good use of horns. The band was way forward on the stage; so my only downside was that I was right next to the drums, which drowned out a lot of their vocals. But, all in all, a very good opener. No encore (again), but perhaps that’s their M.O. I’m not putting my usual “a fave of the night” notations by any song, because, quite frankly, it was all amazing. At the end of Down the Cellar, the crew took Dino’s drum kit away one piece at a time at the end, with him ending on piano and no drums around him. That was fun. As tall as Lions opened for Silverchair when I saw them at Newport. They were good. I have one of there EP’s I bought on itunes. There new CD came out a few weeks ago. I knew they sounded familiar. They weren’t too shabby. RxBandits is definitely one of the best bands out there. While stylistically different, their music is played in harmony with each band member and it only brings out the greatness of the sound.